Wildlife for Tomorrow was created in 1990 to enhance the management, protection and enjoyment of Arizona’s fish and wildlife resources. The Foundation is an independent 501(c)(3) nonprofit organization that works closely with the Arizona Game and Fish Department to provide additional support for projects and education activities where traditional resources are not adequate. Wildlife for Tomorrow’s efforts focus entirely on worthy projects within Arizona and no funds are passed on to national offices or to projects in other parts of the country. The Foundation does not participate in or attempt to influence regulatory, management or legislative decisions, nor does it take a position on controversial or value-sensitive issues. Its single purpose is to support important and worthy projects that make a difference to the wildlife and people of Arizona. Through the Foundation, individuals, businesses and organizations can participate in projects to benefit all of Arizona’s fish and wildlife and the habitats upon which they depend. These projects include habitat improvement, youth and adult education, research and wildlife protection activities. Please contact us about how you can help. Wildlife for Tomorrow Foundation works closely with the Arizona Game and Fish Department to provide additional support for fish and wildlife management, protection and recreation projects and education activities where traditional resources are not adequate. The Foundation raises money and other resources and distributes them to worthy projects only within Arizona. No funds are sent out of state. The Foundation does not attempt to influence Department or legislative decisions nor does it take a position on issues. It sole focus is supporting important and worthy projects that make a difference to the wildlife and people of Arizona. The Foundation conducts recreational and educational activities to both raise money for specific projects as well as to develop relationships with donors. It also conducts or participates in recognition events to honor individuals and organizations for their contributions to preserving Arizona’s natural heritage. For eighteen years the Foundation has honored those individuals and organizations who have made a difference in these efforts through its Arizona Outdoor Hall of Fame. 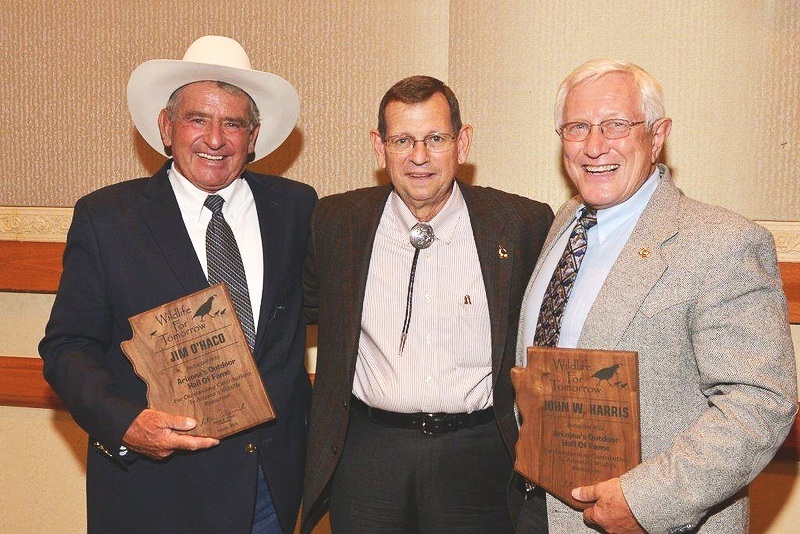 At a banquet held every August, a diverse and dedicated group of outdoor and conservation supporters, including legislators, journalists, artists, club and association activists and the state’s leading wildlife organizations have been honored by induction into the Hall of Fame. In partnership with sponsors Mesquite Power and Sempra Generation, the Foundation administers the Mesquite Wildlife Oasis education project. Located on property adjoining a power generation plant in western Maricopa County, the Mesquite Wildlife Oasis hosts over 2,000 elementary school students from West Valley schools every year for a hands-on learning experience of conservation in action. The Foundation has also been a founder, sponsor and active participant in the Tres Rios Nature & Earth Festival in the West Valley. We have raised funds to purchase and place wildlife water drinkers in areas affected by the state’s wildfires and other areas hit by drought. We’ve purchased target shooting rifles for use in youth shooting programs at shooting ranges, and raised funds to assist in bear relocation efforts during times of bear conflicts in urban areas, and many other projects. The centerpiece effort for the Foundation is the development, funding and construction of the Arizona Wildlife Conservation Learning Center at the Ben Avery Shooting Range facility in north Phoenix. This multipurpose facility will accommodate learning classrooms, an amphitheater, exhibits and offices devoted to the education of Arizona’s school children and citizens of the importance of conservation to our future. Wildlife for Tomorrow offers individuals, businesses and organizations of all kinds the opportunity to participate in projects to benefit all of Arizona’s fish and wildlife and the habitats upon which they depend. These projects include habitat improvement, youth and adult education, research and wildlife protection activities. Please contact us about how you can help.